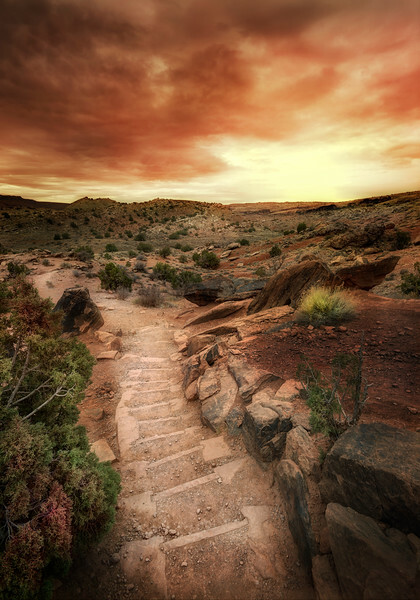 Today, I will take you with me to an area close to the Arches National Park in Utah, United States. The park itself is “made” out of tons of amazing stone structures – which I will show you later, hehe. Today, it is all about an area that is really close to the park – one where there is nothing else than bushes and rocks. The view is incredible, especially because there is this strange color combination made of green of the ground and red of the rocks. I have spent some time there with a couple of friends of mine, and we tried to explore as much of the area in the short time we had. We were relatively unlucky with the weather at first, which is why today’s image was taken on a quite overcast sky. While taking the image and looking at all the red, I thought how nice it would be if I were there during a sunset. As we did not have the time to stay, I decided today to just create a sunset.